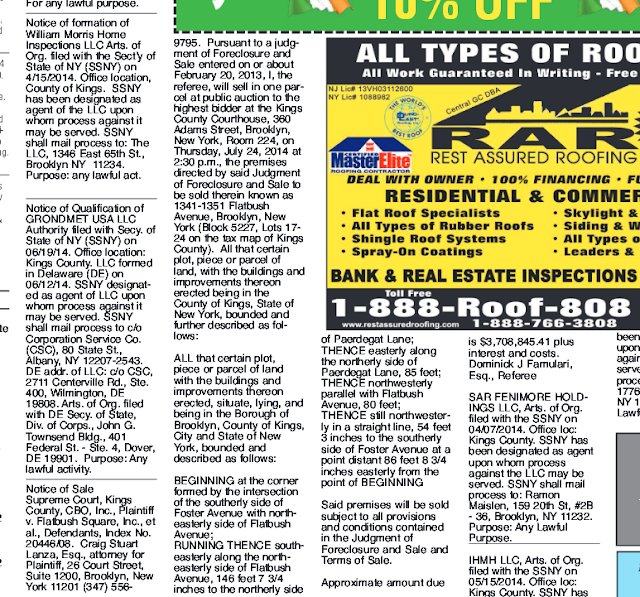 When my sister Mary died unexpectedly just before Christmas, I searched her home in Florida looking for a will. She lived alone and her house had become a repository for photos, documents and memorabilia accumulated from relatives who had pre-deceased her in North Lauderdale: another sister, a brother-in-law, an aunt, a sister-in-law and my mother. There was a staggering amount of paper records that had long since ceased to be of any possible importance. It took days to go through all of it but there was no will. I was born in September of 1947, accompanied during my entry into this world by my twin, Regina, who is now living in a long term health care facility in Limerick, Ireland, not too far from where our mother herself was born in 1911. Regina and I were the seventh and eight of nine children my mother was to bear, and we proved to be simply too many for the ground floor of a two family house. So within days of our birth, my mother's signature appeared on a $5,500 deed and a $3,000 mortgage to buy one of two identical attached brick houses which my family had been renting. 1329 Rogers Avenue was not very desirable: There was a gas station/garage flush to the north side of the two row houses and on the south side barely an inch separated us from a private wooden frame house from which was dispatched a small fleet of trucks based in a large rear garage. So it came as a surprise when the deed revealed we had purchased the house from the estate of a well-to-do family. Mary K. Allison, according to a 1935 auction notice in the Brooklyn Daily Eagle, had taken the house in a foreclosure against a woman named Carmela Ferrante during the height of the depression. Mary and her brother Augustus inherited $150,000 from Henry Prosper Booth, who co-founded the Ward Steamship Line in the 1850s as a young man, providing freight and passenger service to Cuban and Mexican ports. 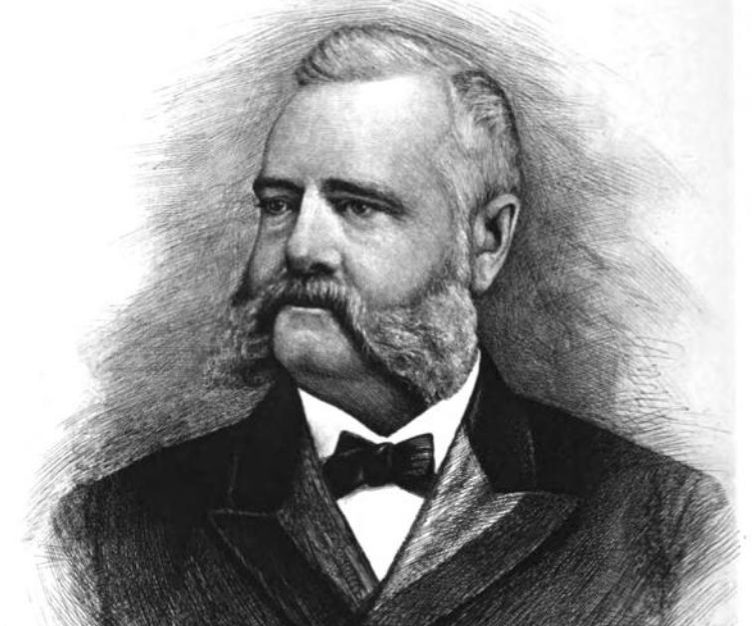 Booth took sole ownership in 1894 and ran it very profitably until his death in 1909. When his widow, Angie Booth, died in 1922, she bequeathed millions of dollars to nautical charities and her heirs, which included the Allisons. Mary Allison rented the house after she seized it but she passed away sometime during the War. So it was her brother, Augustus Allison of 114 Clinton Street, a fancy address in Brooklyn Heights, who, as executor of her estate, signed over the deed on September 18, 1947 to my mother, Hilda Enright. 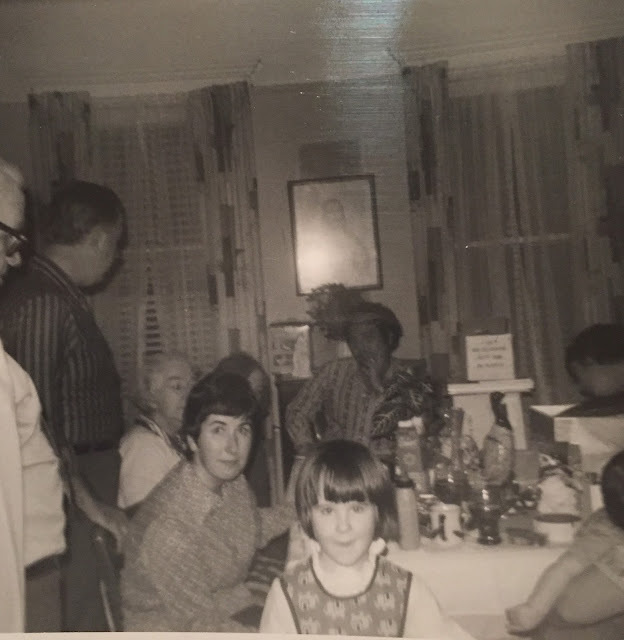 1969 Thanksgiving on Rogers Ave. My Sister Rita (1940-2010) and Her Daughter Mary Catherine Are Looking At Camera With My Mother Seated Behind Them on Left. My mother did not work and my father was employed as an investigator by the City's Welfare Department. Why my mother's name should appear on the property documents was another mystery to me. 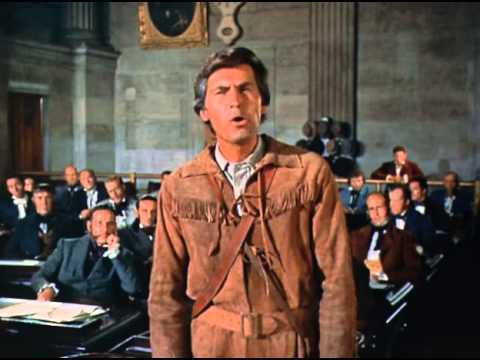 Perhaps it was to shield the property from any liability my father might incur? 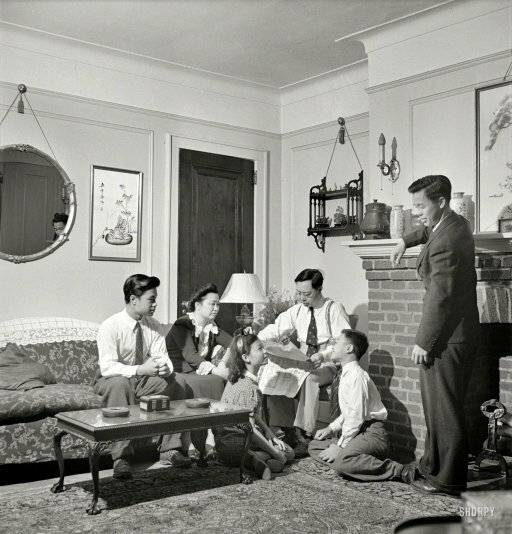 There were no people on either side of my family tree with any money whatsoever in 1947 so where did my parents get the $2,500 down payment ($27,500 in today's coinage)? My parents hadn't owned a car since the 1930's and with so many mouths to feed on a civil service salary, my father often worked 2nd and 3rdjobs (post office helper, evening clerical work, etc.) I suspect the money somehow came from my mother's side of the family (she had 12 siblings), and that's why she signed all the documents. That proved to be advantageous when she sold the house in 1977 following the long torturous dissolution of her marriage. 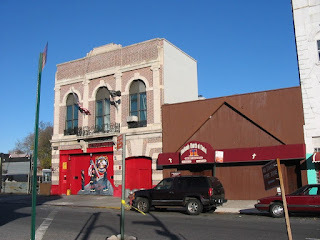 I did more research on the house and it seems to have been originally occupied by a master plumber named Thomas Joseph Flood who had a shop a block away at 1447 Flatbush Avenue. He later became an inspector for the Bureau of Fire Prevention according to the Flood family history online. 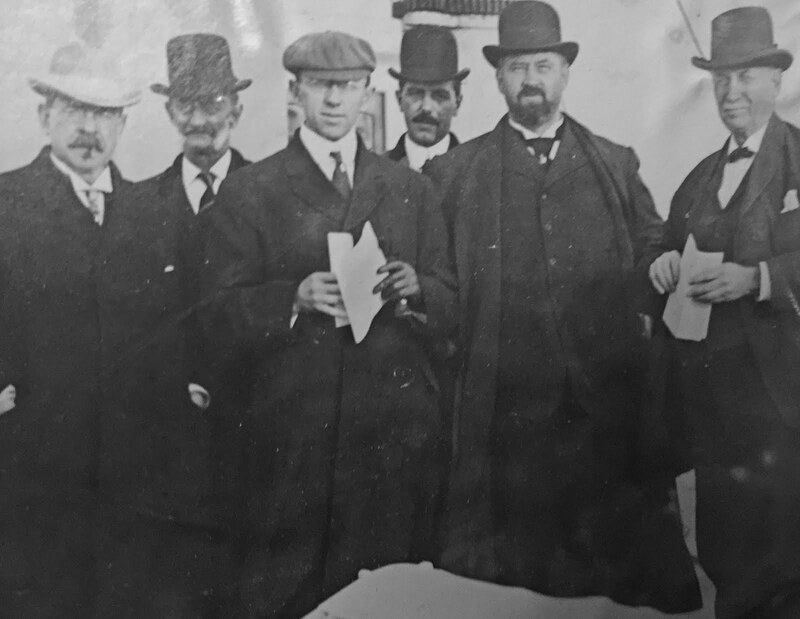 In September 1914 the Brooklyn Daily Eagle reported he was among six men appointed as meter inspectors by the “Deputy Commissioner of Water Supply Gas and Electricity in Brooklyn", which political foes assailed as political patronage violating civil service laws. 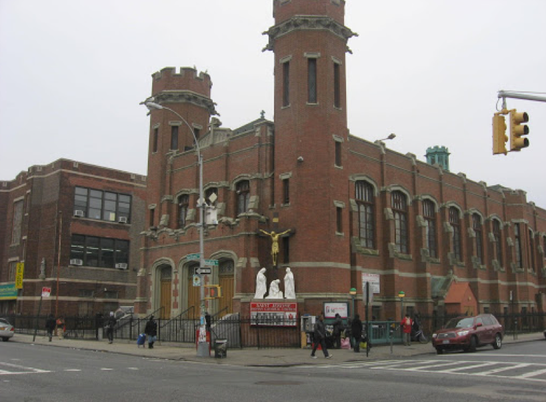 St. Jerome's At Nostrand And Newkirk. School on Left. Flood must have been a sad man at that point. He waked his 40 year old wife Margaret in the home in November 1909 and a month later waked his 16 month old son. In November 1912 he waked his daughter, Margaret Mary. Finally, in July 1917 Flood also passed away inside 1329 Rogers Avenue at the age of 46. Still the deaths there kept on coming: in September 1921, 50 year old Benjamin James Bradney died; he was a member of "Anglo Saxon Lodge O.S.S.G. and a past Grand Master of the State of New York", the token non-Irishman in this long parade it would seem. In November 1943 Dorothy Regan Sheedy, the wife of Frank Sheedy, described as “night foreman at Robbins Shipyards”, died of pneumonia five days after delivering a healthy baby boy. 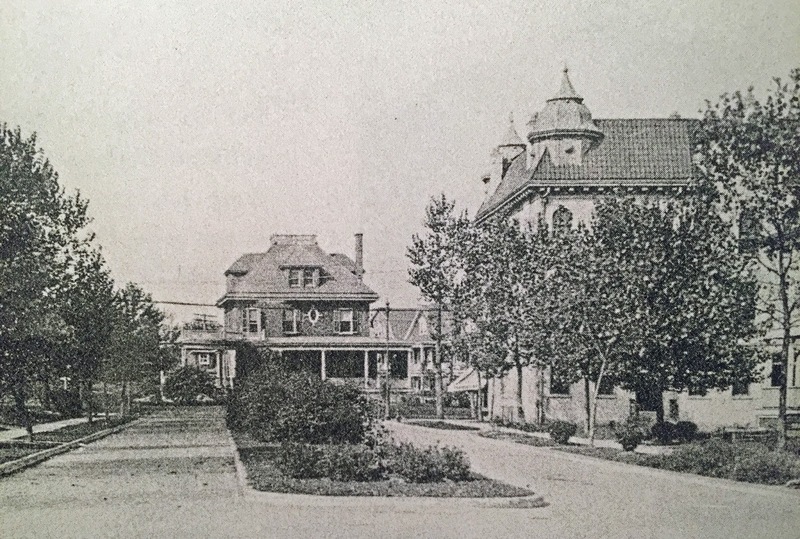 Altogether, I counted four wakes held in the home, with the body transported to nearby St. Jerome's Church for a funeral mass and then to Holy Cross Cemetery on Brooklyn Avenue for burial – a destination many an Enright has taken. 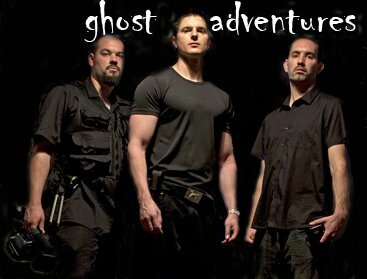 When I was about seven years old, my father and I witnessed what ghost-hunting-adventurers are fond of calling “a full-body apparition”. We were awakened from our sleep by the sound of loud footsteps coming down a stairway outside the bedroom which my younger brother Michael and I shared with my parents, thanks to a fold-out cot for me and a mattress that sat atop a pile of bricks for Michael. The noise roused my father, and he started yelling "Who is it?" which woke me up. A woman in gray hair wearing a white robe/night dress noiselessly came through a locked door against which stood a chair piled with spare pillows. This was of course impossible. But there she was, standing at the foot of my father's bed. All was then quiet as I watched in awe from my cot, no more than four feet to her right. My father shouted "Who are you, what do you want?" The old woman raised her arm, pointing forward. Then disappeared. 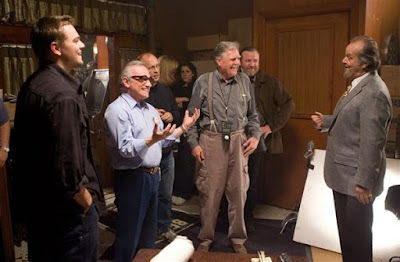 He went on to tell me that the apparition looked like pictures of my mother's mother, who had died a couple of years before he met my mother. My father thought his mother-in-law had come to warn him to treat his wife better. Sounded like a guilty conscience to me, so I resisted saying: “It would have helped us all a lot, Dad, if you had taken that advice.” Looking back at the prior deaths in the house, the ghost could have been Dorothy Sheedy or Margaret Flood. Or perhaps it was just a spirit fed up with all the kids running around the house, asking my father to cease with the procreation already. I grew up with three brothers and four sisters (another brother pre-deceased my birth) in a four bedroom house on a noisy mixed commercial/residential block just north of Flatbush Avenue. 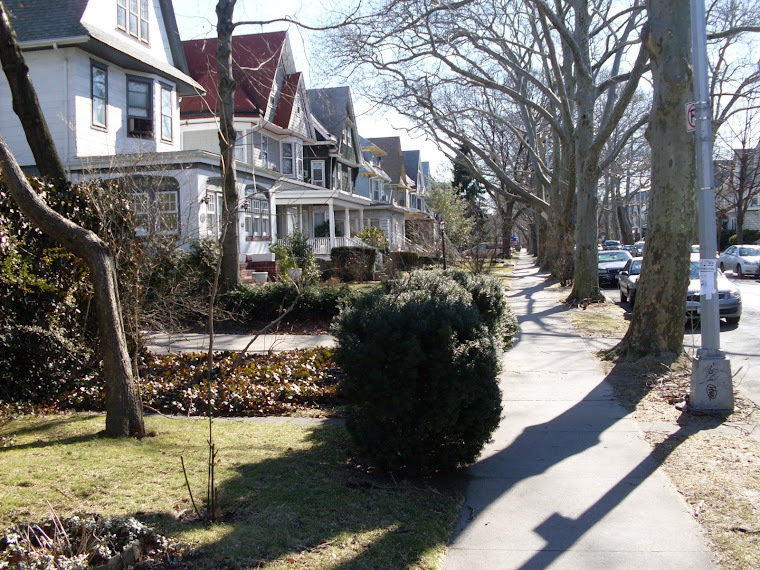 Naturally, everybody called the neighborhood Flatbush but in fact we lived in what had once been the town of Flatlands. More on that later. 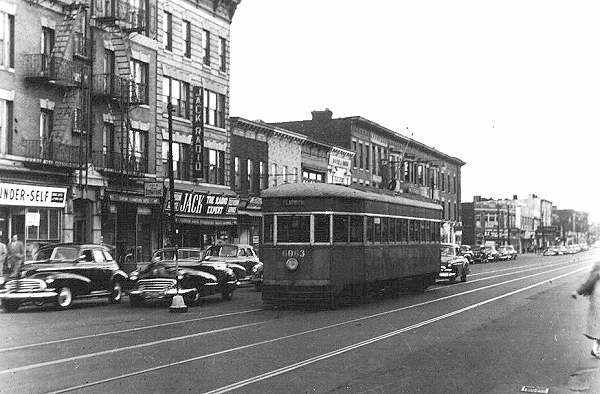 1950: Flatbush Avenue Trolley Nortbound Approaching Rogers and Farragut. 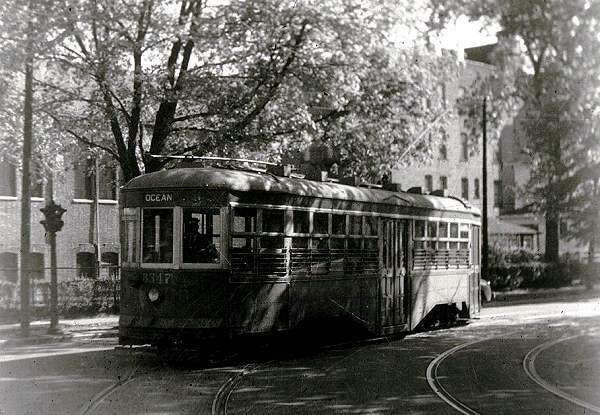 1950: The Trolley That Ran Past Our Door Is Shown Here Turning From Farragut Road Onto Ocean Avenue. Our Lady of Refuge Church Is Visible Behind It, Before It Was Expanded. Herman Edert and Michael Enright Both Got Married There. One of my earliest memories was the electric trolley that ran past our door. It stopped running when I was four, part of the great post-war retirement of trolley lines to make way for the misery of vehicular traffic. One trolley on the nearby Church Avenue line did survive long enough for me to catch a ride when I was in 4th grade. That was 1956. 1956 was a great year. The Dodgers won the pennant on the last day of the season, and I was on a CYO (Catholic Youth Organization) little league team which played only a mile and a half away in what were then the wide open fields of Flatlands. I loved playing baseball, maybe because it was the only thing I seemed to be good at. 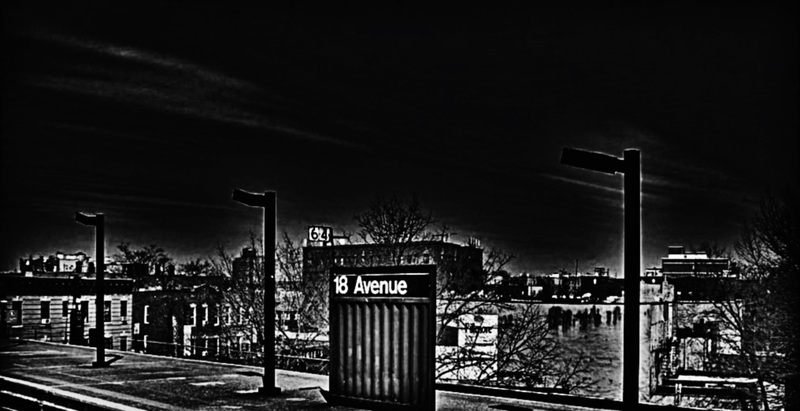 But the trolley tracks were barely paved over and kept peeking through the tar throughout my youth, reminding me of the rails that stretched from Manhattan Beach, east of Brighton and Coney, all the way up to Crown Heights. The hills there formed part of the glacial ridge that separated Brooklyn's urban north from its rural south until mechanized transport replaced inefficient horse power at the turn of the 20th century. As a kid, I was fascinated by history and very inquisitive about the odd topography of my surroundings. Behind our backyard was what I considered a Wild West stage set: a series of old battered garages, little changed from the time only four decades earlier when they served as stables for the horses that drew the carriages in the age before electricity. 1912: Map With Red Indicating Populated Blocks. The red solid line extending from Bay Ridge up through Greenwood Cemetery, then along Prospect Park West and thence east out to Queens, represents a natural ridge line - essentially where the glacial advance stopped - and is roughly 180 feet above sea level. The ridge boundary slowed development south of it, which had been farm and woodlands. Intersection of Rogers and Flatbush Avenue is almost dead center on the map. Flatbush Avenue ran diagonally against the street grid, creating a number of traffic triangles as it wandered through southern Brooklyn. 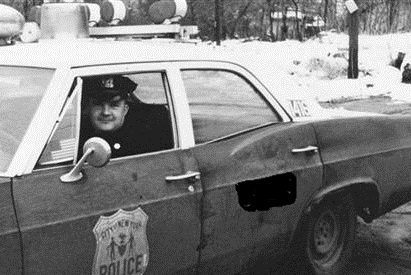 At that point in its 10 mile journey from the East River to Jamaica Bay, it ran on a collision course with Rogers Avenue. 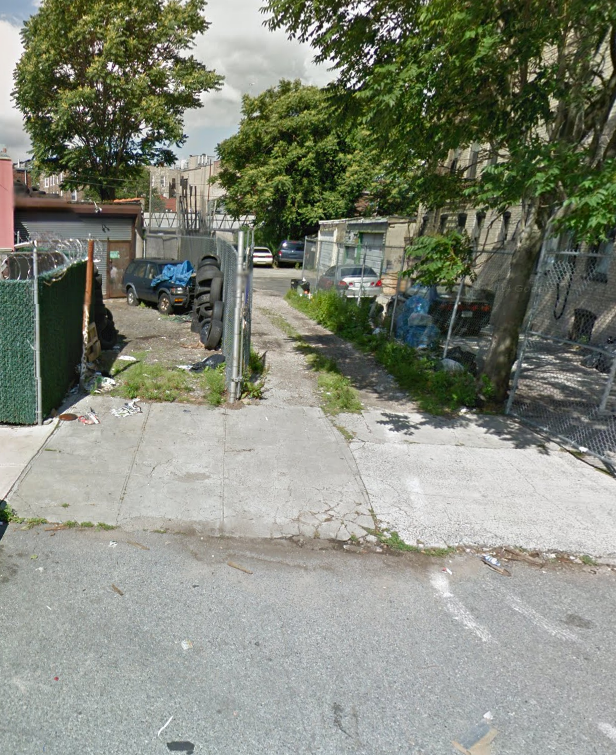 Thus, toward the southern end of our block, stores that faced on Flatbush had exits on Rogers. There was a firehouse near the corner, just off Flatbush, and the fire trucks there bore an insignia of "The Jolly Rogers". 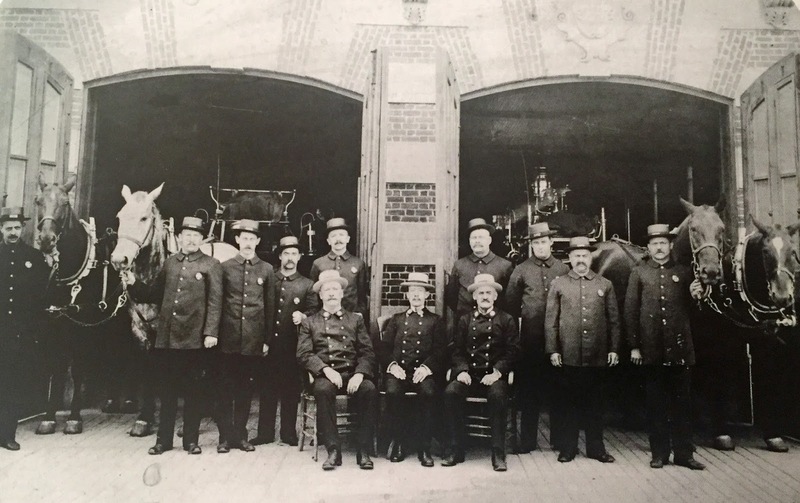 The firehouse dated back to 1899, built on land deeded to the City by the Germania Real Estate and Improvement Company. 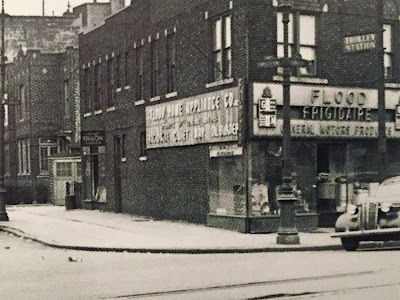 1944: Farragut Theater. Used As Induction Center In Mornings During WW II. Germania bought up large parcels of farm land in Flatbush and Flatlands following the opening of the Brooklyn Bridge, when travel to and from Manhattan no longer depended on ferries. The land on which my house sat, a few doors down from the Jolly Rogers, was at the eastern edge of a 125 acre farm owned by the Lott family, Dutch settlers who had arrived three centuries earlier. 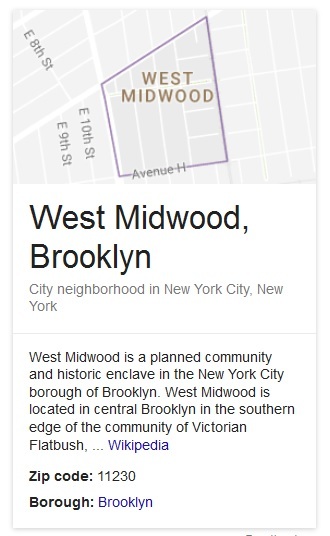 They sold 100 acres of it in 1898 in what was then the largest realty transaction in New York history, the same year New York City had been formed by the political unification of five counties. At the turn of the 20th century, rural Brooklyn was vanishing. The Brooklyn Bridge in 1883, followed by the Williamsburg Bridge in 1903, the first subway train in 1908 and a third East River bridge - the Manhattan in 1909 - made vast expanses of sparsely populated land south of the ridge lines very attractive to developers. 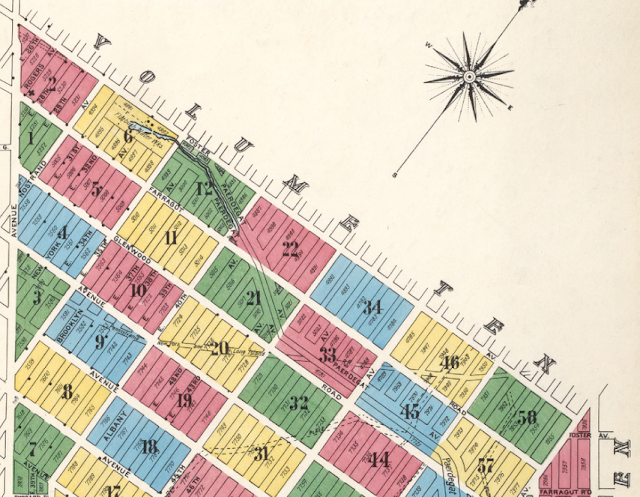 1890: Map of Flatbush Street Grid - Except for Parkville, Sparsely Populated. 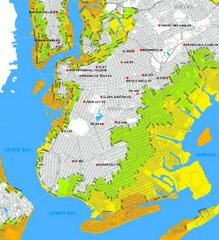 Lott Farm Is Most of Yellow Area North of "Manhattan Beach Rail Road"
Ironically the wooden frame house that my wife and I purchased in 1988, our first home, also sat on the former Lott farm. It was located 14 blocks away from Rogers Avenue in a mysterious place which as an adolescent I called "the land of normal people". 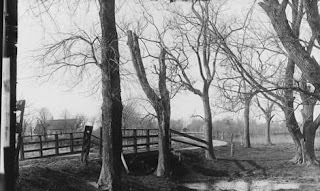 When my parents, who separated from time to time and would die far apart from each other, had loud shouting matches or other turmoil rocked our house, I would set off for the footbridge that crossed over the Brighton railroad tracks on Glenwood Road. 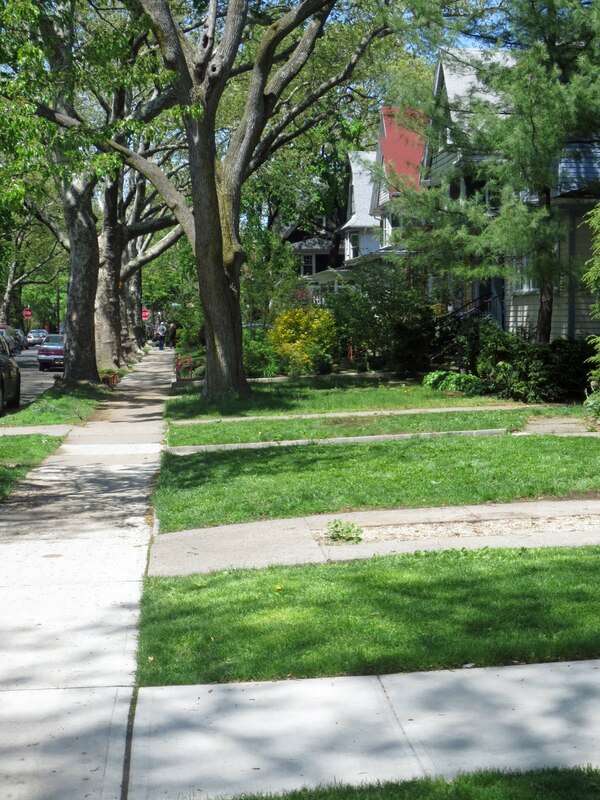 There I might have walked past my future house on Argyle Road as I wandered the tree-lined, quiet, orderly streets to quell my anger and clear my mind. 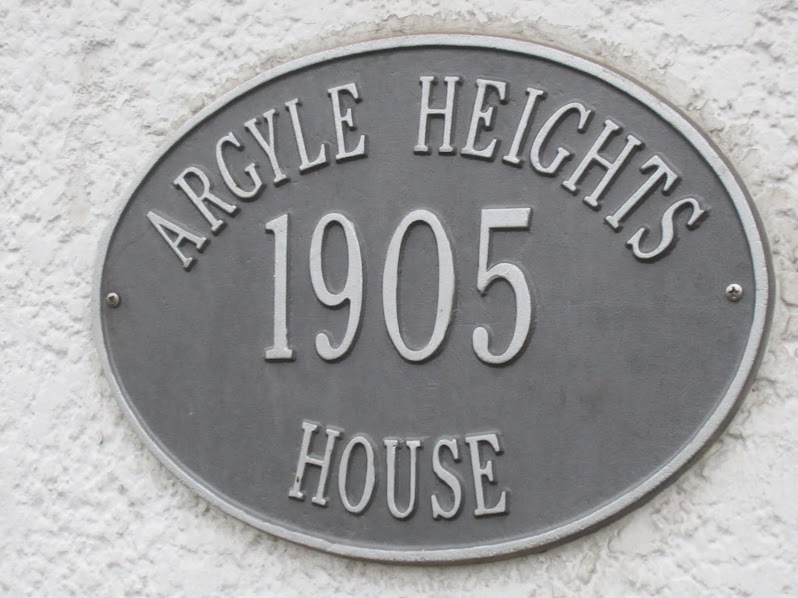 I later learned that my home on Rogers Avenue and my house on Argyle Road were both built in 1905. The most memorable building of my youth was a movie theater on Flatbush Avenue, the rear of which extended along Rogers Avenue for a length longer than you could hit a spaldeen on a fly – about 150 feet. 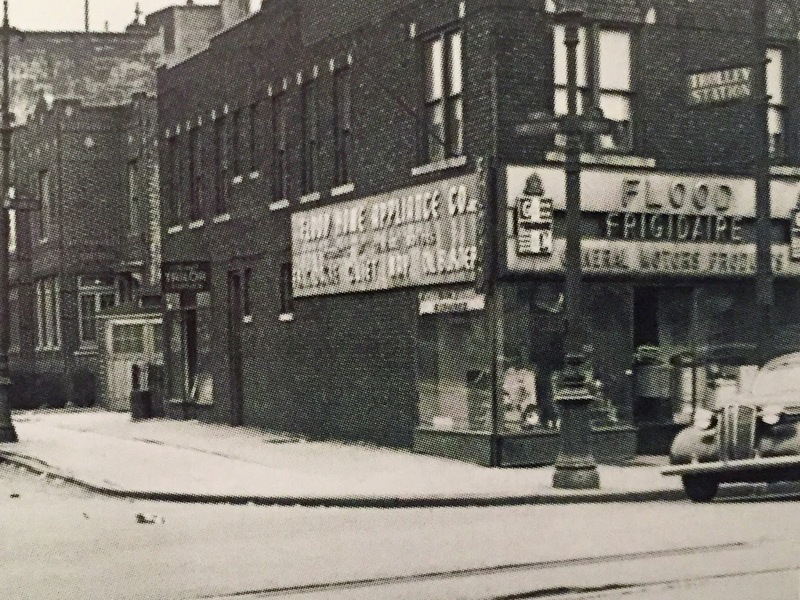 It was called The Farragut, named for Farragut Road, which intersected the corner of Rogers and Flatbush to form five corners. 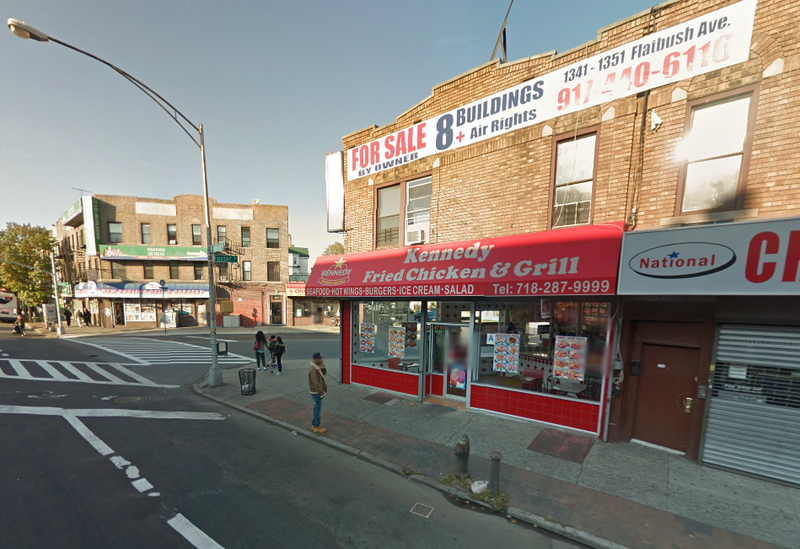 That was also the name of a bar which had entrances on both Flatbush and Rogers. When you could walk in The 5 Corners and order a beer without getting laughed at, you had become a man. 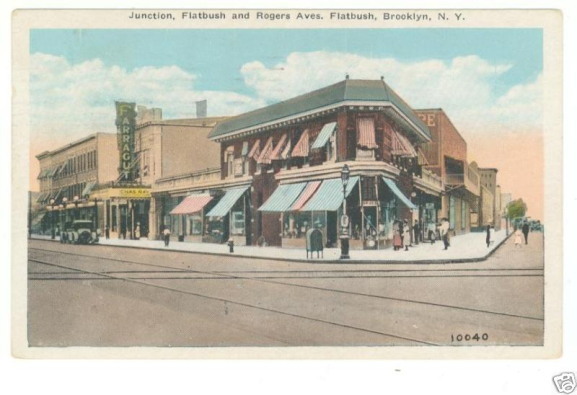 1922: Postcard Showing Flatbush (Left) and Rogers Ave. Note Rear of Farragut Theater on Right With A Fire Escape We Often Climbed. 2014: Same Intersection. The Farragut Is Now a YMCA. Wedged between the Farragut and The 5 Corners was a bicycle shop called Cohen's. The front on Flatbush sold new and used bikes and was presided over by Mr. Cohen, who everybody hated because he treated his repair guy, a middle-aged black man named Leroy, so mean. Leroy was the one we kids dealt with all the time. He would fix our flats or sell us streamers for a nickel at the back of the shop on Rogers. 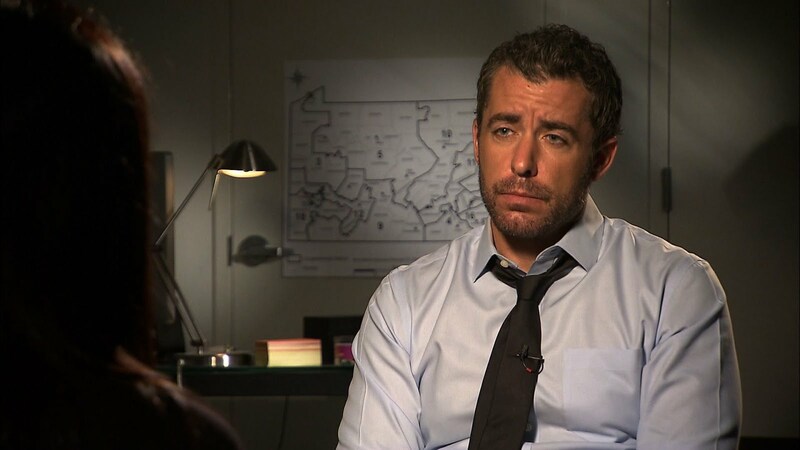 Mr. Cohen would yell at him a lot, especially if he was just talking with us about baseball or some such. Leroy rode to and from work on an old English Racer and sometimes you could hear him approach because he'd be singing. We never found out where he lived but it was probably a mile away because we rarely saw any African-Americans in our neighborhood back then. Listening to all our parents discuss race it was not hard to imagine why. In the middle of the block, in an apartment house directly across the street from us, the neighborhood nut resided. 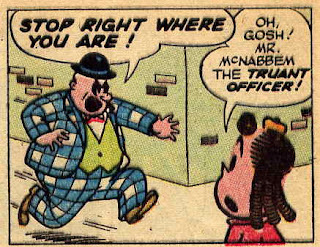 He was Mr. Steele and he looked exactly like the truant officer, Mr. McNabbem, in the Little Lulu comics, complete with a Hitler-esque mustache and a bowler hat. Except, unlike McNabbem, Mr. Steele would frequently walk around bare-chested, covered only by a knotted tie. And he would often be spotted urinating against trees. 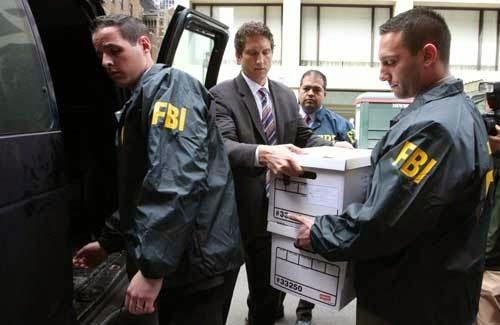 It was said his father had been Ambassador to some Eastern European country who died shortly after World War II and left his son a monthly stipend in perpetuity. He was also receiving messages from space aliens and my oldest brother, Buddy, a copy boy for the New York Times, would regale us with stories of Mr. Steele showing up in the lobby of the Times building, demanding to speak to reporters about the aliens' latest transmissions. The northern end of the block wasn't nearly as interesting. There was a vacant lot on the corner of Foster Avenue that appeared to have a dried-up brook which would become a little lake when it rained. At times, some brave entrepreneur would open a used car business there but they never lasted. 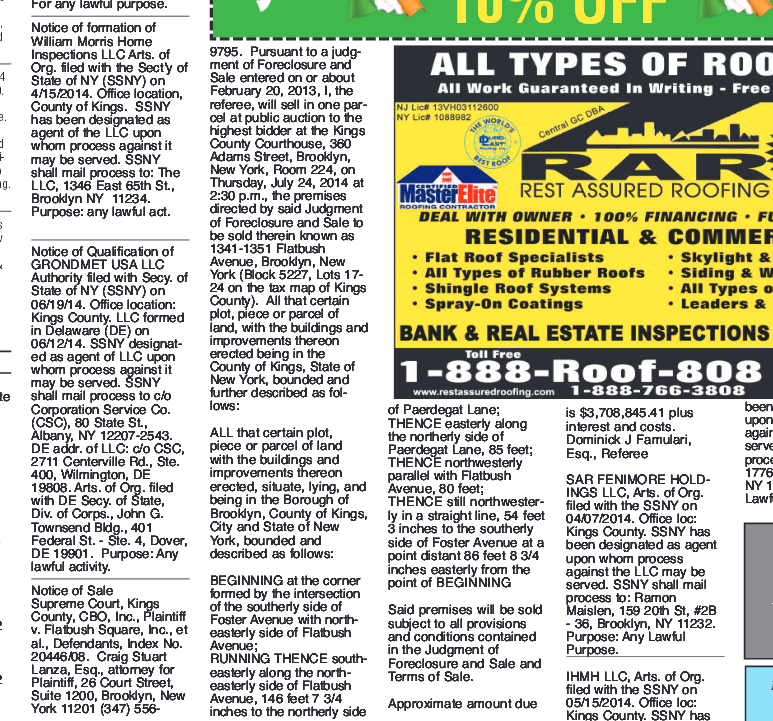 Last week I drove by and the lot once again had a “Used Cars For Sale” sign. 1950: Flatbush Looking East On Foster Toward Rogers. Billboard Barely Visible on Empty Lot at Corner of Rogers and Foster. If you stood in that lot facing west, you could see gaps between buildings extending the two blocks to Flatbush Avenue. I learned only recently that this gap was the last vestige of Paerdegat Lane, an Indian path as old as the Dutch settlements of the 17th century. 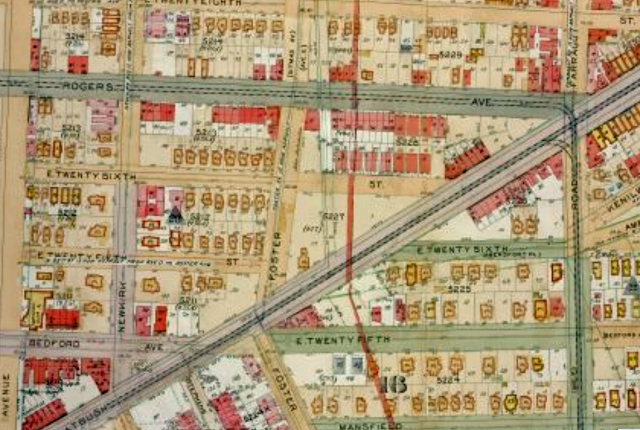 The Lane formed the boundary between the towns of Flatbush and Flatlands prior to their absorption into Brooklyn during the four years preceding Brooklyn's annexation by the City in 1898. Thereafter this town demarcation line became almost insignificant. 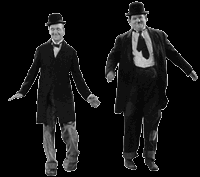 However, there were still contracts and franchises in force which followed these old boundaries and they did not expire until decades after the merger. 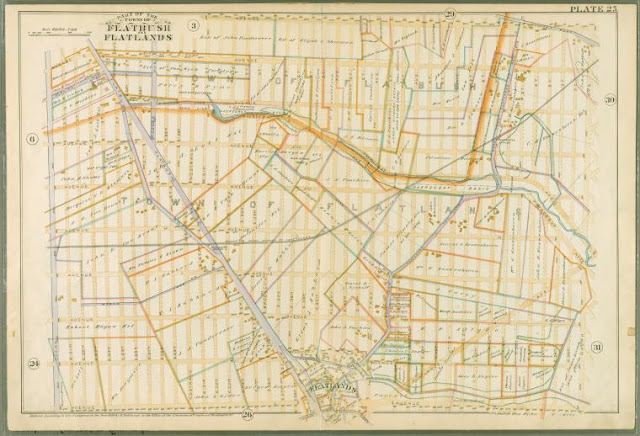 Moreover, the political ward boundaries below Prospect Park, created after Flatbush and Flatlands were annexed, followed the old town boundary lines as well. 1638: A Map Published in 1924 Showing The First Dutch Settlements. Note Paerdegat Lane Slightly Left of Center. 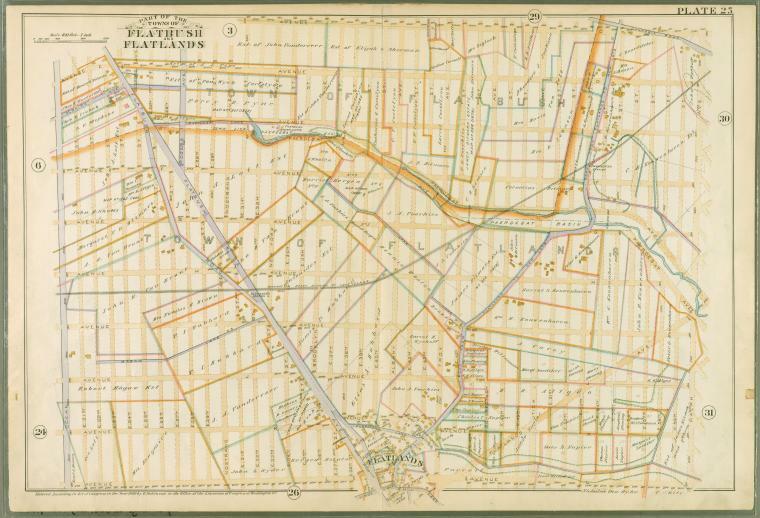 1873 Map of Flatlands. Paerdegat Creek Is Shaded Snake- Like Figure Extending to "J.A.Lott" Farm at Top Left. 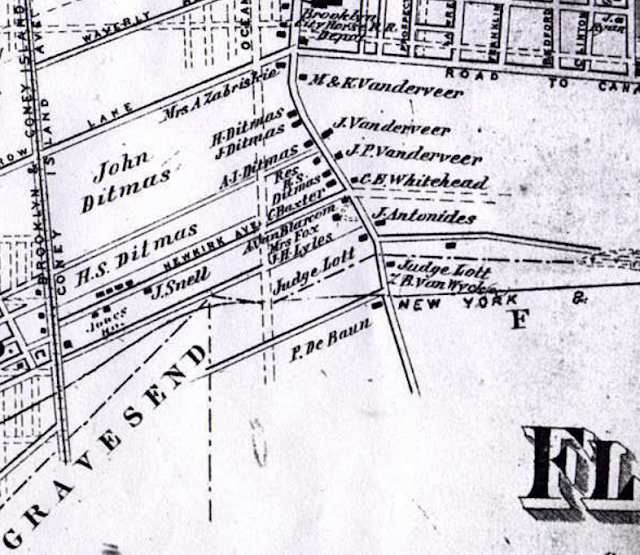 1873: "Judge Lott" in Center of Map Appears East and West of Flatbush Avenue. The Tip of The Triangle Above The Word Gravesend Is East 17th Street and Foster Avenue Today. 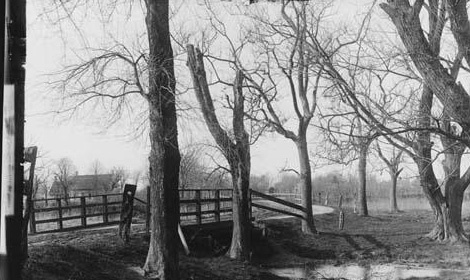 Paerdegat Lane was named after a fresh-water tidal creek which flowed out of Jamaica Bay that once ended in a marsh near Nostrand and Foster Avenues. 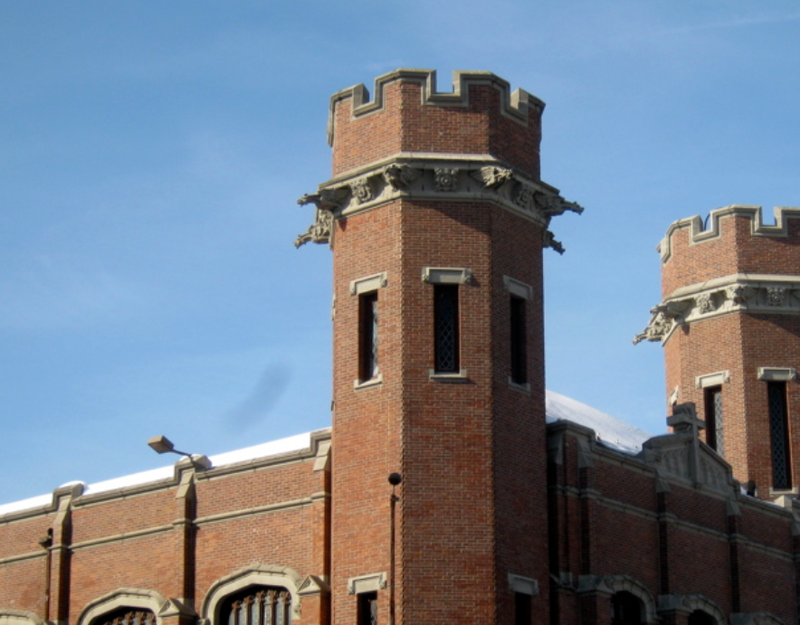 * The Brooklyn Water Works Company used that water and underground springs to supply Flatbush and Flatlands, thanks to a franchise with the City of Brooklyn that the City of New York inherited. The water they supplied eventually became so foul, most Flatbush home owners had installed primitive filters in their homes to clean it until the utility was finally closed down in 1947. The Water Works' land was used to erect the Vanderveer Housing Projects in 1953. But over time, the water table in the area, no longer being tapped, appreciably rose and a permanent stream started flowing briskly through the Newkirk Avenue IRT station under Nostrand Avenue. 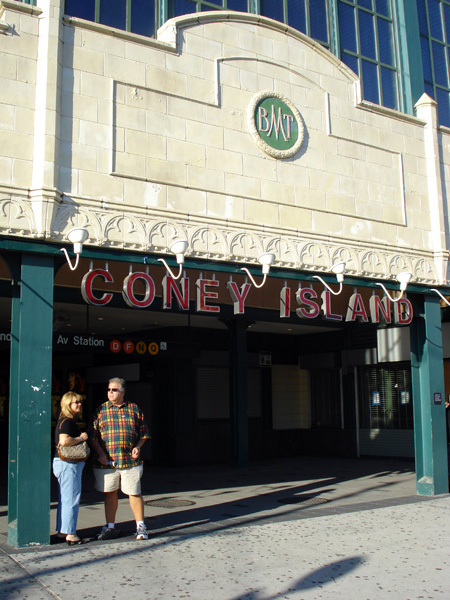 Visitors who first saw the noisy brook running in a trough between the rails that extended all the way to the the next and last stop, Flatbush Avenue, were somewhat stunned. But we took it for granted. 1916: Flatbush Water Works From Southeast Corner, Newkirk and Nostrand. 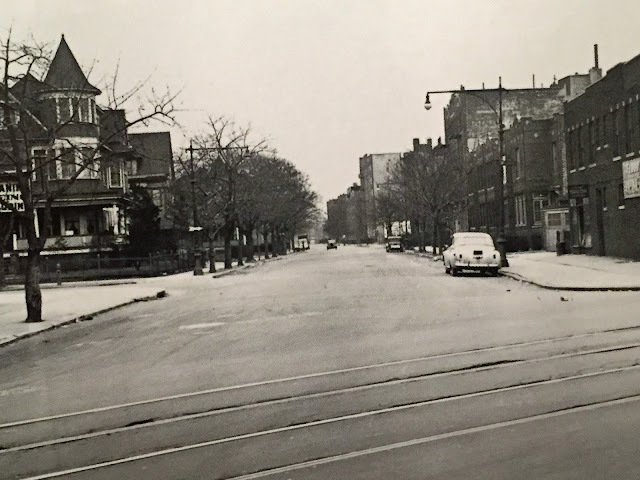 The Lane that was named after the Creek paralleled Foster Avenue, anywhere from 80 to 200 feet to its south, and ended just west of Flatbush Avenue. 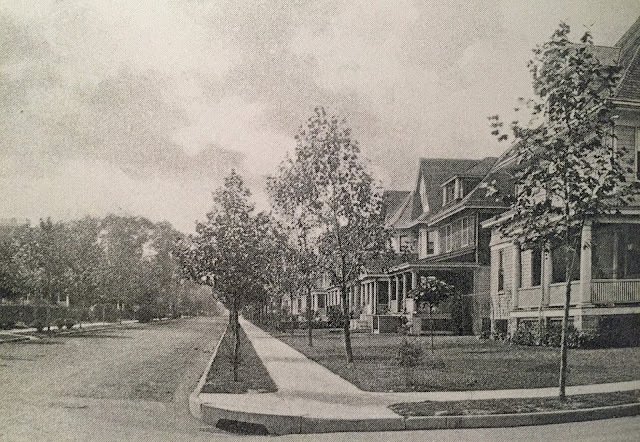 Before Foster was widened and paved, Paerdegat Lane was the major east-west path joining eastern Flatlands with the towns of Flatbush, Gravesend and New Utrecht. 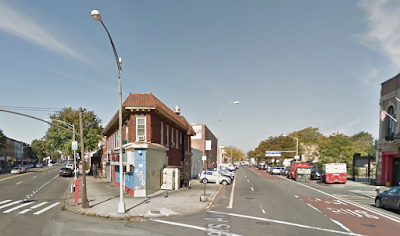 In fact the boundary lines for all four towns converged at the corner of Foster Avenue and East 17th Street. 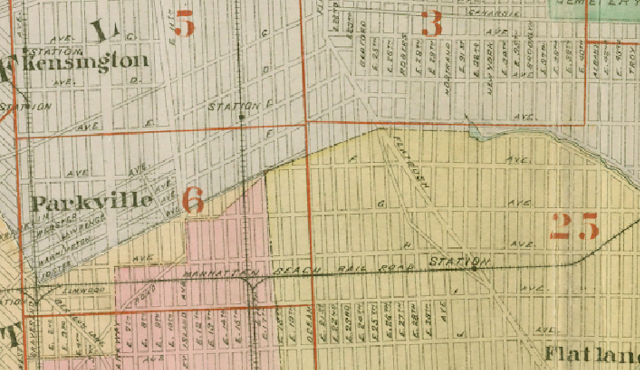 1890: The Purple Diagonal Line Left of Center Is Flatbush Ave. The Orange Line Connecting Paerdegat Creek With Flatbush Ave Is Paerdegat Lane. 1932: Flatbush Water Works, Future Home of Vanderveer Projects, Seen From Newkirk Ave, East of St. Jerome's Church on Nostrand Avenue, Visible on Far Right. 1904: Flatbush Water Works Visible Under the "O" In Volume. 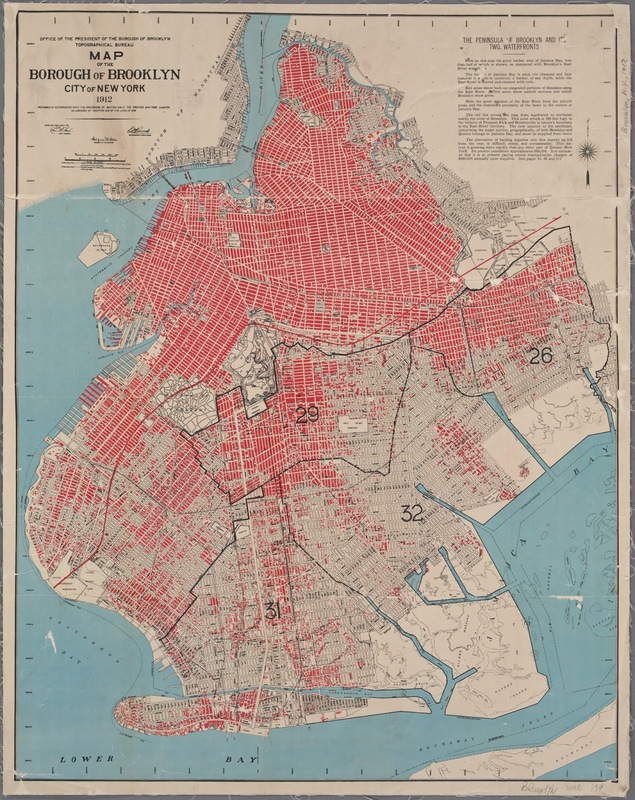 Paerdegat Lane Is The Dotted Line Visible in the Uppermost Left Red Quadrangle Extending From Rogers to Flatbush Avenues. When I put “Paerdegat Lane” into a search engine, I found a public real estate posting in October 2014 which still referenced the long-gone path as a boundary of property at the corner of Flatbush and Foster that was being auctioned. Looking at aerial views of the neighborhood, it's easy to see where Paerdegat Lane once was. When I researched news stories about the Lane, I came across some interesting anecdotes. 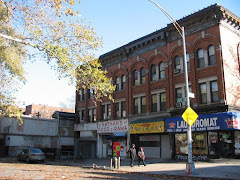 In July 1895, some hoodlums were attacking a woman near the Flatbush Water Works on Nostrand Avenue and when the police responded, the criminals escaped by fleeing on foot across Paerdegat Lane into the town of Flatlands where the Flatbush police did not have the jurisdiction to continue their pursuit. 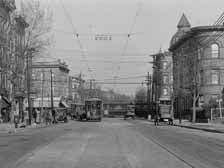 In November 1919 the Brooklyn City Railroad Company operated a Flatbush Avenue trolley under an old franchise inherited by the City that allowed it to charge 5 cents per ride. 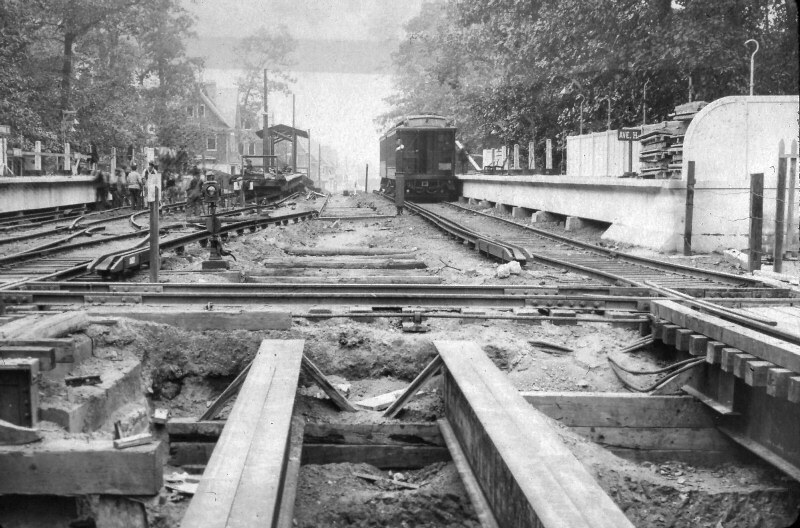 When the City rejected its plan to increase revenue by charging an extra nickel for passengers riding beyond the old Flatbush town line into Flatlands, the railroad played hardball and hired goons to forcibly eject passengers refusing to pay the extra nickel once the southbound trollies reached Foster Avenue. 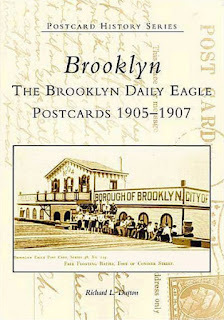 The Brooklyn Daily Eagle reported somewhat gleefully that the trolley company was forced to admit to the Borough President that the original franchise ended at the legal boundary between Flatbush and Flatlands, which extended “200 feet south of Foster Avenue to where Paerdegat Lane intersected with Flatbush Avenue”. 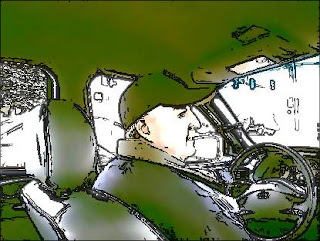 The headline the following day read: “2nd Fare Point Moves – 200 Feet More Ride for Nickel”. 1950: Trolley Station at Corner of Flatbush and Foster. 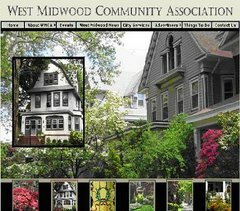 Reading the second story, I remembered an older sister, Julie, who, late in her life would compile a wonderful genealogy of our family, telling me that the garage/stables behind our home were once used by the horse-car companies since the Flatbush Avenue line ended only a few blocks away. These coaches were the major means of transportation from the City of Brooklyn to the Towns of Flatbush and Flatlands until the 1860s when horse cars began to travel on rails built along Flatbush Avenue and Coney Island Avenue (then called “Plank Roads” since uneven wooden planks were all that stood between you and he muddy road). By 1900, all the horse cars had been replaced by trolley cars tethered to electrical lines that ran overhead. I always doubted Julie's claim. Why would the Flatbush line end anywhere but at “The Junction” - the key crossroads where Nostrand and Flatush Avenues intersected, which is where the IRT subway also terminated. But when I saw the old photographs and maps I suddenly realized this would be the perfect place for stables – just south of Foster Avenue, a few feet from the Paerdegat Lane town line. 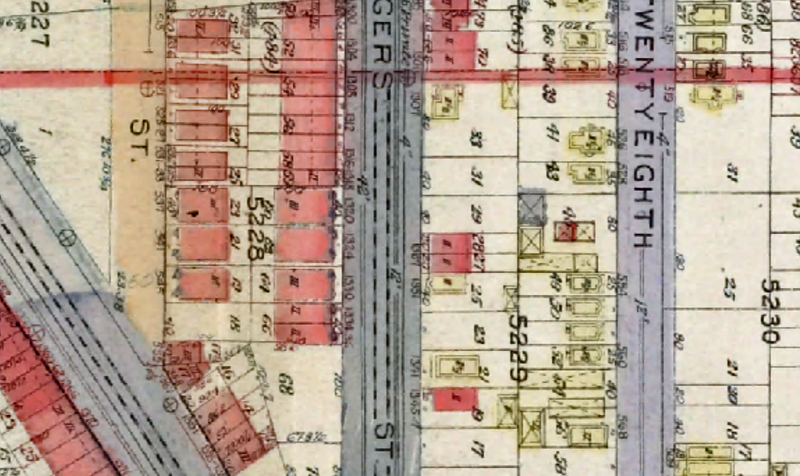 1916: The Two Red Squares in Dead Center Are 1327-1329 Rogers Ave. Behind Them Are Structures With Xs, Signifying Stables on E. 28th St. 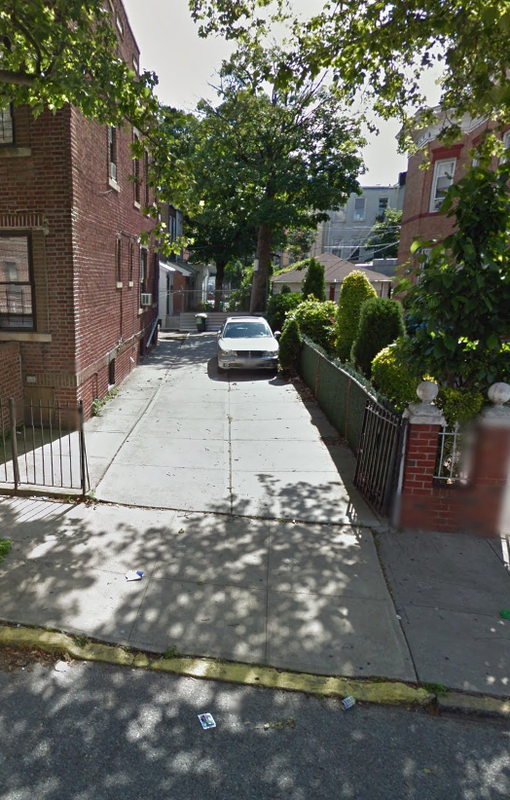 When I was 11, a developer knocked down those garages and built four brick row houses. The same year, the Dodgers left Brooklyn for Los Angeles, the Farragut Theater was converted into a bowling alley (which we couldn't afford) and my dog was put down because we had no more money to feed him. I always thought 1958 was a terrible year. The destruction of the garages also sealed the "secret passage" that led from our backyard to Cathy O'Neil, who lived three houses south of ours, in a home which faced on East 28th Street. Cathy and I had a very cerebral friendship, given that we would write short stories together in my back yard but as the years passed I developed a crush on Cathy, so the fact we now had to walk around the block to see each other (from 558 E 28th St to 1329 Rogers Ave was only a fifth of a mile to walk but then you had to ring the bell and announce yourself to (UGH!) adults) - a terrible blow. That and the fact that I was a year younger than her made everything seem suddenly hopeless. So maybe the insurance policy was based on my being very depressed? A pre-teen suicide risk? I do recall around this same time my mother started taking me to the Silver Rod drug store at Newkirk and Nostrand Avenues to buy me a malted milk every Friday afternoon. The guy behind the fountain would make the malted in a blender, then pour it into a Coca-Cola glass and (be still my heart!) leave the metal canister, which was good for two more glassfuls. My mother said it was “to fatten me up” because I was just skin and bones. Could my health have been so bad that she took out insurance on me? My older brother Jerry told me that he recalled the insurance salesman would come around every week to collect the premium and that he would help my mother scrounge for pennies to pay him. But he thought the policy was for my father. Maybe the salesman gave her a package deal? 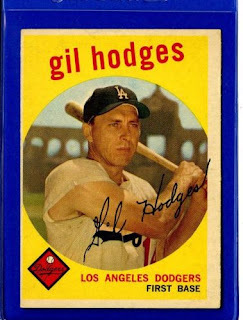 The last childhood blow I can remember involved Gil Hodges, the Dodgers first baseman, and one of my heroes (along with Duke Snider, “The Duke of Flatbush”). 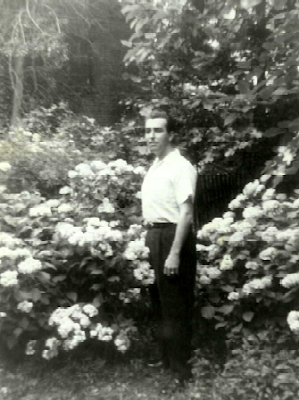 Gil continued to live in Brooklyn, on Bedford Avenue, only a mile southwest of us. A devout Catholic, Hodges would often attend Church fund-raisers and in the Winter of 1958 he came to St. Jerome to present the CYO All-Star baseball awards. The previous year I had been an All Star. But in 1958 I couldn't play ball because we didn't have any money for uniforms. I attended the ceremony and watched my former teammates go up on stage and shake hands with Gil. I was devastated. Hell, I still feel sad writing about it now! 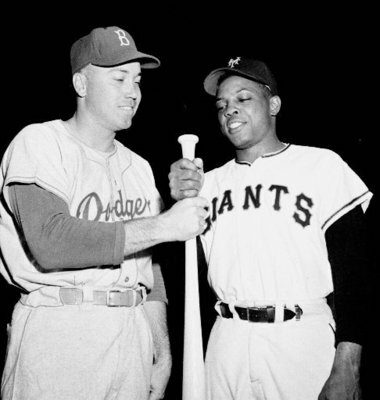 Hmmmm...I remember this was after the 1958 season, the first one the Dodgers played in L.A. And I recall it was cold. It had to be before March, when Gil had to report for spring training...Hmmmm...Maybe this happened in late January- early February 1959 and threw me into such a depression that, given my perpetual state of undernourishment, had me knocking at death's door? But just like Paerdegat Lane, I refused to die? The most likely explanation is that my mother used the life insurance policy as some sort of savings account, building equity that she was eventually able to withdraw at some later date to buy us food when my father stormed out without leaving us anything from his pay envelope. Money was always a problem for the Enrights. 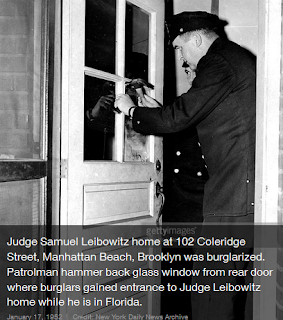 My first job was watching for shoplifters at a souvenir stand in the Stillwell Avenue subway arcade in Coney Island. When the Summer ended and I was getting ready to start the first year of high school my father took me aside and urged me to keep working. He said school wasn't that important and besides, I was 13, had working papers, “so you can get another full time job quick when the arcade closes down for the season.” My mother overheard the conversation and sternly told my father that just because they had to drop out of high school to work, that didn't mean their children had to. “Education is the way up and out,” she said to me after my father walked off, mumbling, as was his want. “Don't you ever forget that,” she gently scolded me. I never did. Many years later I heard myself telling a bunch of students at Tilden High School who came to hear me talk about careers in law enforcement that "education is the way up and out." And I had a PhD and a nice house to prove it. In truth, however, I remember hearing more encouragement from my friends' parents than I did from my own, particularly the Edert family. The older wooden house next to us was owned by a German immigrant named Paul Edert, who sent his only son, Herman, off to fight the Nazis. Herman came back with plenty of souvenirs from his Third Army tour of hell, stockpiled in the basement under a model train set he built for his own son, Ritchie. 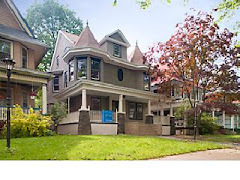 A few years after Herman returned from the war, he married Joan Hale who lived across the street at 1306 Rogers Avenue. 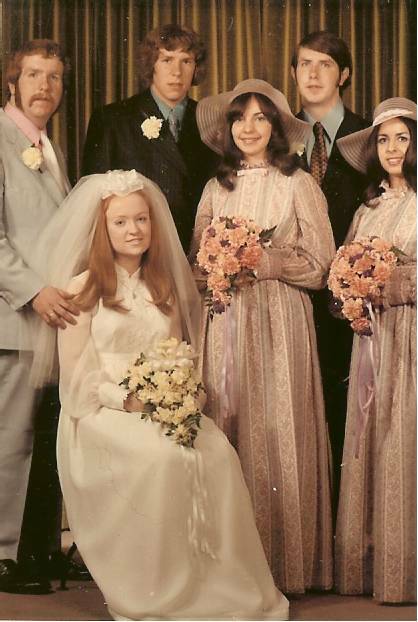 They had a marvelous marriage that produced four children and they treated me and Michael as sons, taking us with them and Ritchie (before the arrival of their younger offspring) on local trips in their wood-paneled Ford station wagon. It was the first time we ever rode in a car. Michael and I would spend endless afternoons in Ritchie's side yard, which was actually a driveway for Herman's trucking business, Reliable Express. It has been noted by many great minds throughout history that habitats of one's youth appear incredibly smaller when re-visited after a long absence and this is certainly true here - I remember the Ederts' driveway extending for what seemed like the length of a football field - or at least from home plate to center field, considering the stick ball we played there. 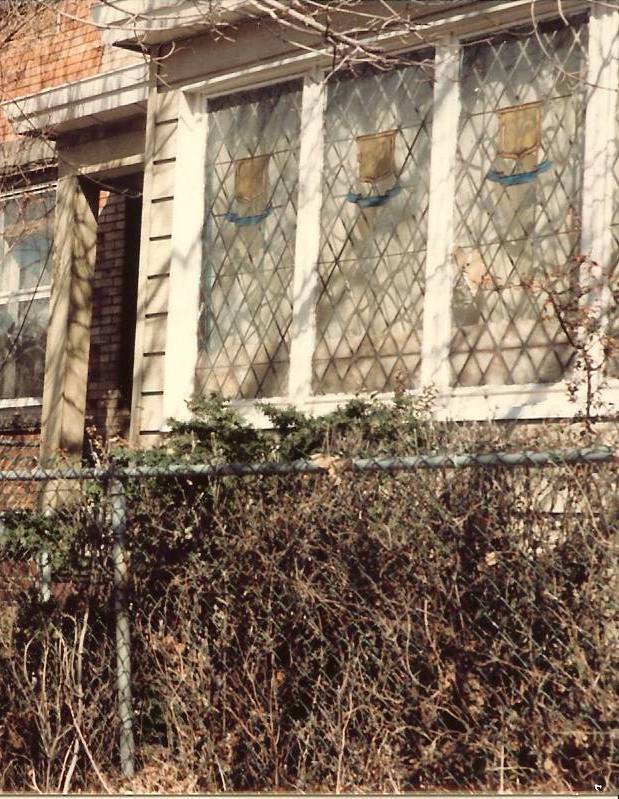 When I snapped the photo below on a frigid February afternoon in 1984, I couldn't believe how huge the space was in my memory. And I suddenly remembered the best times we had in that yard were during Lent when the Reliable Express trucks would off-load palm branches from Florida in burlap sacks against the walls that lined the driveway. Herman had the contract with the Diocese to distribute the palms to all the Catholic churches and so the burlap bags reached almost to the 2nd floor, laid out in a sloping fashion that almost invited intrepid exploration by young boys. King of The Hill games would inevitably result in the three of us tumbling down one by one until exhausted, we would build forts with the palms, pretending to man bunkers, waiting for the Nazis to advance, just like Humphrey Bogart in Sahara, the film we loved to watch on Million Dollar Movie, almost as much as King Kong, which was another game the palm piles inspired. Along about 1970 Ritchie threw a party where Michael met Karen Eckstrom, who lived a few blocks away. 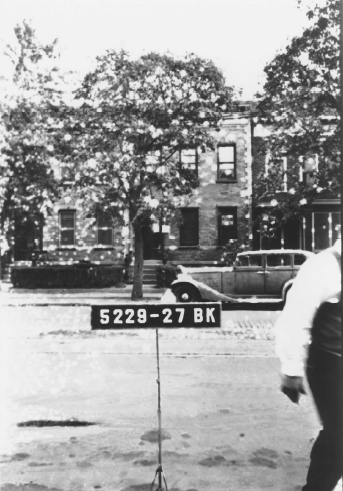 A year later they were married and living in a walk-up apartment on Clarendon Road, just off Nostrand Avenue. 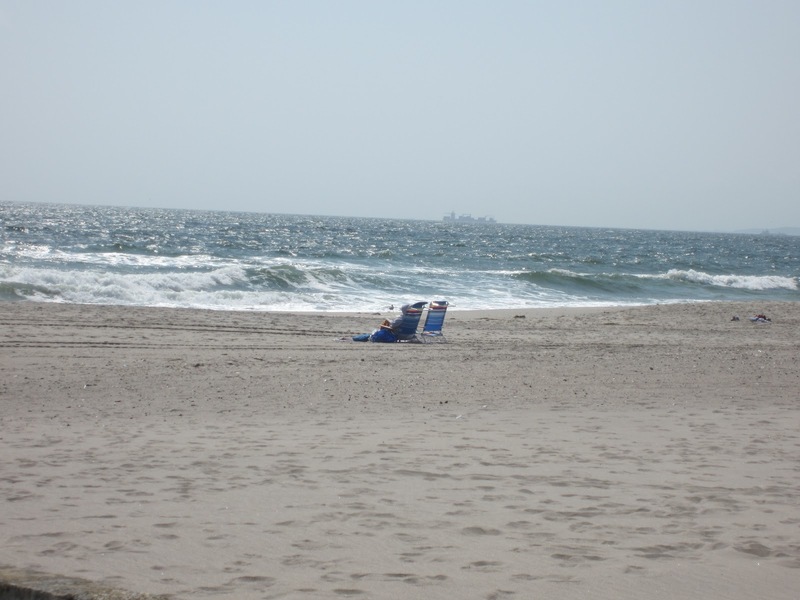 At about the same time, the Ederts moved to Rockaway Beach, which on our block was considered Heaven on Earth, and I never saw them again. 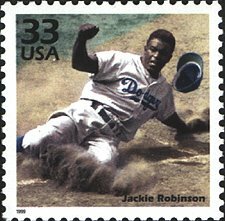 As for me, following a pre-induction physical at Fort Hamilton in 1969, the draft was suspended for a lottery and my birthday was picked sixth to go. So I dropped out of Brooklyn College grad school and quit my full time Wall Street job, waiting for Uncle Sam's "Greetings". But the letter never arrived, so I visited the draft board in Cadman Plaza and was told I was a moron for not knowing my correct birth date. As it turned out, my Selective Service records were a mess. This experience led me to explore government work as a career. But first I bummed around the country. I eventually wound up back in Brooklyn in a Park Slope apartment. 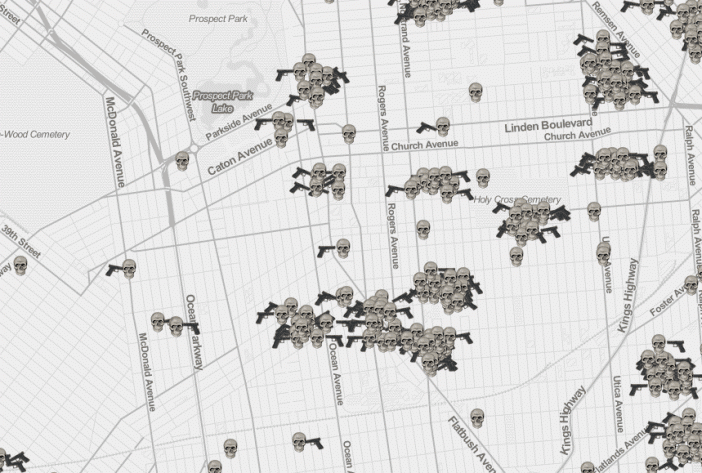 2015: "Death Map" of Flatbush Indicates Flatbush and Rogers (Dead Center) is Ground Zero With Vanderveer Projects A Close Second. Each Skull Represents a Killing or Auto Fatality, 2008-2015, per NY Daily News based on NYPD Stats. Nothing Stays The Same, Huh? 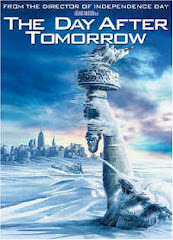 A cold wind was blowing when I got home from school and it was just as cold inside the house. My mother was sitting at the kitchen table and her eyes were red so I knew she must have been crying again. "Where's your sister?" she asked. "Jeannie is with her friend Linda down the block." I didn't say that Jeannie didn't want to come home because it was warmer in Linda's house and because Linda's mom usually had after-school snacks. My mother's lower lip was trembling as she attempted a smile. "There's not enough money for bread," she said but before that could sink in, she hurriedly added: "So we're gonna look for change, OK?" "Sure, I know the best places to look," I said and in a flash I was on my knees in the hallway, my fingers groping under the edge of the linoleum. 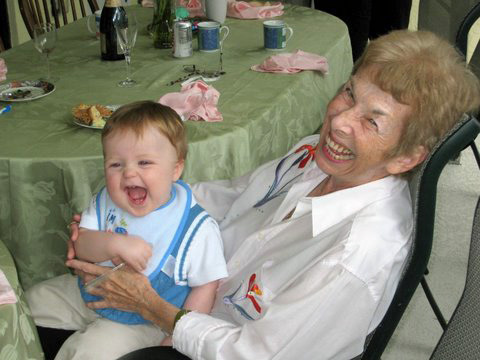 If there was a way to ease my mother's sadness, I was going to do my best for her. As my fingers accumulated dust, I noticed rips in the linoleum from the last time we looked for money. I decided to break new ground and ran to Jerry's room. One of my two older teenage brothers, Jerry had been drinking a lot lately and when he came home he sometimes just passed out on his bed. So I figured change might have fallen out of his pockets. Skinny as I was, I crawled underneath his bed easily, even with its sagging mattress. Yes, it was 1958, the worst year that ever existed. First, we didn't have any money to pay for a uniform, so I couldn't stay on my little league team. Then we didn't have enough money for dog food, so one day I came home from school to find my younger brother crying. He said Lance, our Spitz Spaniel, had been hit by a car while we were at school and was dead. "Mommy took him to the hospital to bury him," Michael sobbed. My older sister Julie then took me out to the porch to show me where it happened but as soon as we got out of Michael's sight, she whispered "We had to give Lance to the ASPCA because we don't have any money to buy his food." I brightened, thinking that Lance was still alive. "So can we visit him until we get some food?" I asked Julie. Julie's eyes brimmed with tears. She was the 6th of 9 kids and although she was only three years older than me and Jeannie and six years older than Michael, it was her job to take care of us when our mother wasn't around. And right then I guess she wished someone could take care of her. "No, Joey. The ASPCA had to put Lance to sleep." "That's OK," I said. "We can go tomorrow when he wakes up!" Jackpot! I found two quarters and a penny under some old tissues under Jerry's bed. I crawled back out and ran to the kitchen. My mother was on her knees feeling for lumps under the linoleum. "We just need a quarter, Joey, to get a loaf of bread." She was still intent on finding coins and wasn't looking at me as I held out my open hand. My childhood as I remembered it wasn't always that gloomy but when it was bad, it was really awful. Hey, we survived. Bruised, tattered, sure, but most of us bulled our way through and made better lives for ourselves and our new families. 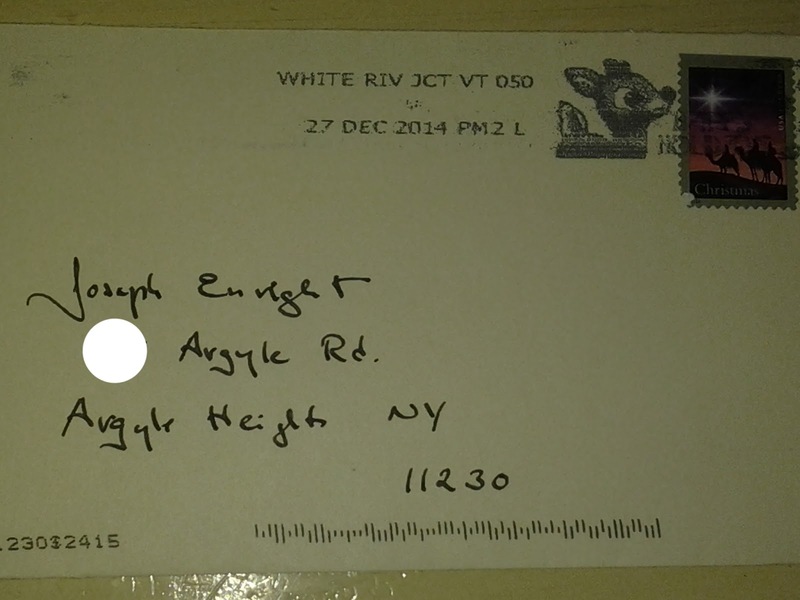 Sometimes though I wonder whether the ghosts of 1329 Rogers Avenue have stirred at all since the Enrights departed. As for communications from my own deceased family members, whose growing ranks I shall join sooner than later, I did get what I always have considered a very upbeat message from my brother, Buddy. He died in my arms in 1979 as I was helping him to his bed, his body wracked with cancer. A couple of months later, I was in a motel out in the Hamptons and I dreamed that Buddy was waving to me from a UFO. He and I both shared an interest in the subject, prompted in part by Buddy's being dispatched to the lobby of the Times on many an occasion to placate the folks, like Mr. Steele, who were getting radio beams directed to the wire coat hangers they had wrapped around their foreheads. Despite all the nuts it seemed to us there had been many unexplained sightings and we wondered if indeed Earth was being visited or monitored. Although in truth we also enjoyed hearing the bizarre tales told by the "contactees" who were getting phone calls from space. In my dream, Buddy was very happy, telling me that our spirits did survive death and that the universe was wonderful and we would see each other again. It was a very vivid dream and it ended with his telling me to go to the balcony of my motel room. I woke up and walked to the balcony and slid open the glass door. It was a beautiful, clear night. 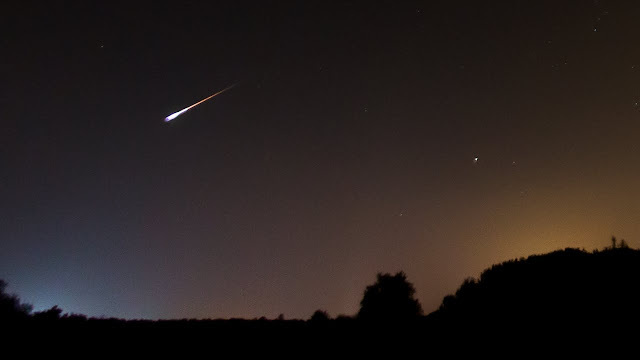 I looked up, and there, streaking across the sky, was a shooting star. 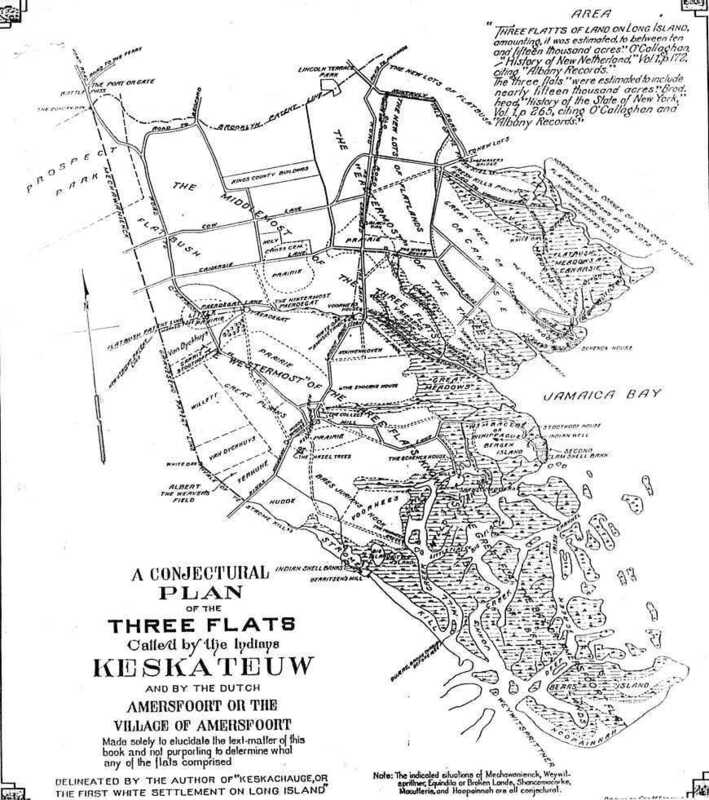 * Per Wikipedia: “The [Paerdegat] waterway was an important part of a failed plan to transform Jamaica Bay into an alternative port to New York Harbor. 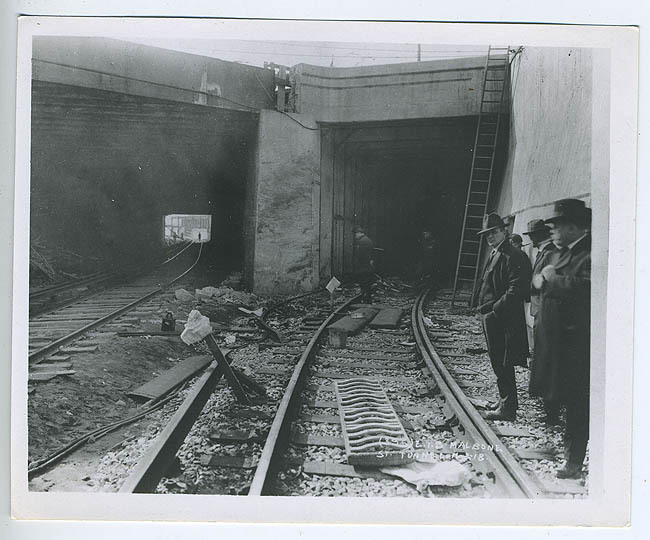 In January 1931, the New York City Board of Estimate approved a plan to build railroads on both sides of Paerdegat Basin, connecting the Long Island Rail Road to Canarsie Pier to the east and to Floyd Bennett Field to the west. Paerdegat Basin was dredged to a depth of 16 feet, but was abandoned soon thereafter..." Apparently Paerdegat is an old Dutch word that has something to do with a horse gate. A biblical reference apparently. For more on Paerdegat Basin, see my later post here.